All five members of *NSYNC were on Hollywood Boulevard yesterday to unveil their star on the Walk of Fame! 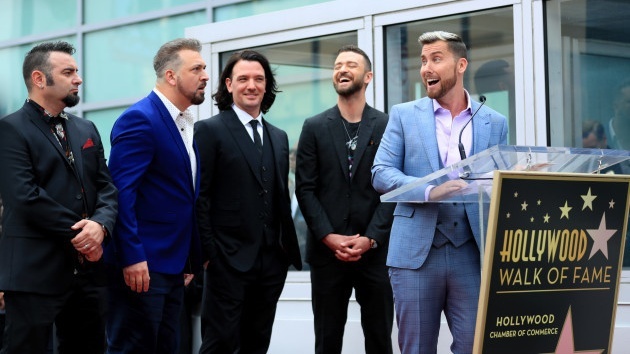 The group which consisted of Justin Timberlake, Lance Bass, JC Chasez, Joey Fatone and Chris Kirkpatrick reunited for the ceremony as they were inducted for former TRL host Carson Daly and talk show host Ellen Degeneres. JC thanked the group's late producer and writer Robin Wiley saying *NSYNC is made up of an apostrophe and five letters. Robin Wiley: I always looked at her as the apostrophe in the band." Lance Bass talked about his fear of coming out as a gay man during his time in the group for fears it would destroy his career but he thanked his bandmates for supporting him. He said "So many nights onstage, I'd see young, gay fans singing their hearts out and I wanted so badly to let you know, I was you. I just didn'ty have the strength then. But I do today and so let me say loud and proud to all my LGBT brothers and sisters, who embrace me and show me the way to be who I am, thank you so much. "I was a kid when we came together and I'ma man today because of the family I have and you. I love you guys." Justin Timberlake, who is currently touring his Man Of The Woods show thanked all five of the members mammies.